Roberts, the digital radio specialist, has launched a new iPod add-on that brings DAB and FM radio functionality to the iPod family. Called Robi, the £50 accessory allows users to tune into both digital and analogue radio broadcasts with the minimum of fuss. One of the criticisms of Apple's otherwise acclaimed iPod range is the lack of a built-in radio, DAB or otherwise. The tiny new device addresses this by adding radio capability without greatly compromising the iPod's svelte dimensions. It also acts as a wired remote control, giving users control over volume and track selection within a playlist. Robi - which is around the size of a matchbox - is actually a discreet radio with a wired remote and a set of in-ear headphones (which also act as the radio's aerial). 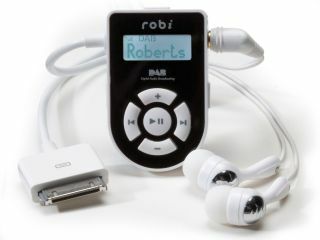 Robi is compatible with second-generation iPod nanos and fifth-generation iPods and according to the maker is "the world's smallest DAB/FM radio receiver accessory".